From the feathered-leaved palm tree and the conical roofs across is a distance of about 300 meters. I clicked this shot today as I was sending my worker back to his village from work at my farm. The two yellow boats on the left are deep sea trawlers and on the right are smaller coastal fishing boats. This river is called the Kemena River and as a small boy I used to row a tiny boat to reach this side of the river ( foreground) with my brothers to collect firewood from the sawmill which were all free for the taking. 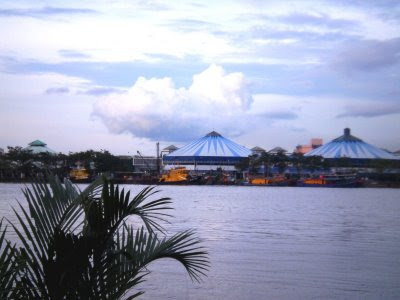 Our family used to live on the Bintulu town proper side of the river (where the conical roofs are) in the 60's-70's. The conical roofs take the shape of our local 'Terendak' , a working hat used by Melanau men and woman for shade against the sun and rain. The blue conical roofs are the wet and dry markets, whereas the green one in the far background ( towards the left) is the 'Tamu' or jungle produce market. The peculiar palm tree in the foreground is our kind of riverside tree. It grows submerged in water. Called the 'Nipah' in our local Melanau dialect, it grows abundantly along both sides of the Kemena River for kilometers up river where the brackish water at high tide is saline and at low tide fresh. 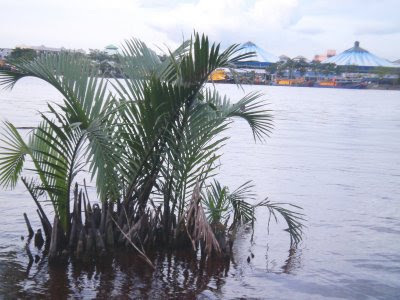 Often people refer to it as the Mangrove Palm because it is prevalent in mangrove salty marshes or tidal mudflat areas. Saudara Eki, Thanks for dropping by. I am a loss to answer your query. At present I am living in both worlds. Next week I'll be back in Kuching and you'll see more posts from Kuching then.In Bintulu I am busy fertilising the oil palm trees at my eco-farm while there is plenty of rains in November. I guess they will all be fertilised towards end of this week. I'm planning to go to Kuching on the 1 st of December. Salam.